650,000 trucks in fewer thanks to the Port of Brussels! Did you know that the transport activity of the port of Brussels avoided in 2017 an additional influx of 650,000 trucks in the city? “A number that represents more than 2,000 trucks per day, from Monday to Saturday, including” stated Mohammed Jabour, Port of Brussels’s president in the foreword of the 2017 Annual Report of the public institution. 2017 was a very positive year for water traffic: overall traffic increased by 6.9 million tonnes (7%), own traffic by 4.8 million tonnes (8,8%) and containers also broke a new record. Building materials once again confirm their dominant position in the port activity in Brussels (58.9%). 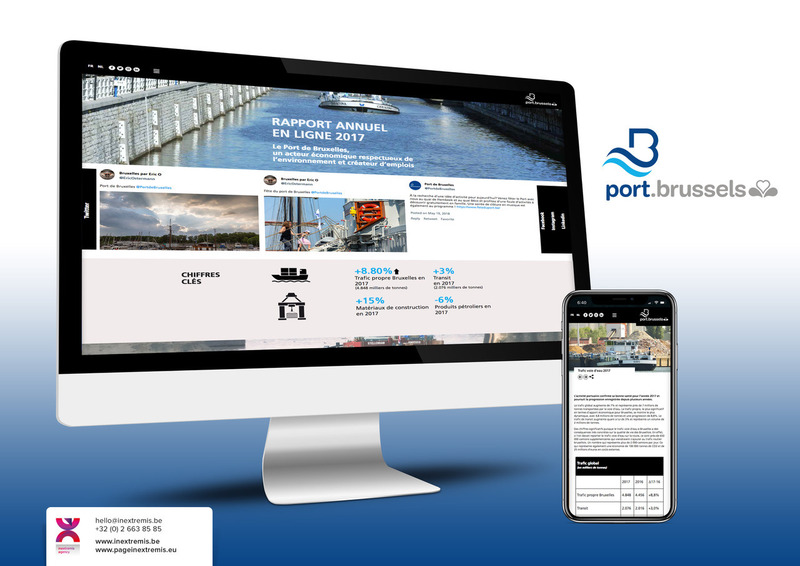 The Port of Brussels is a public service from the Brussels Capital Region that is managing, operating and developing the port, the outer port and the port facilities of the Brussels-Capital Region. The Port of Brussels offers 6 km of quays along the waterway which crosses the Brussels Region from north to south. The second largest Belgian inland port enjoys an ideal location in the centre of Europe. It is a seaport accessible 24/7, 5 hour’s sailing from the Port of Antwerp via a canal that has only two locks between Brussels and Antwerp. The Port of Brussels is in charge of the traditional port operator missions: it hosts about 200 companies on its estate, active in various sectors (construction, logistics, petroleum products, etc.). Do you want to know more about the Port of Brussels? Check the newly released Annual Report! The digital version developed in French and Flemish can be consulted on a smartphone as well as on a tablet or a computer. The Annual Report 2017 was developed as an online publication made within an intimate creative dialogue framework involving the communication agency, Page in extremis and the Port of Brussels communication team. Page in extremis realises major web-based communications projects for many well-known European institutions and associations. 1) The definition of a “brand strategy” aligned with the development strategy of your organisation. 2) The creation or relooking of your visual identity aligned with a new brand strategy and supported by easy to use guidelines. 3) The improvement of your “Communication Programme” by incorporating integrated communication campaigns, memorable events, eye-catching publications and innovative digital solutions. 4) The creative development and production of innovative printed and digital communication tools. Based in Brussels, the communication agency helps organisations engage with their stakeholders and convey their messages.